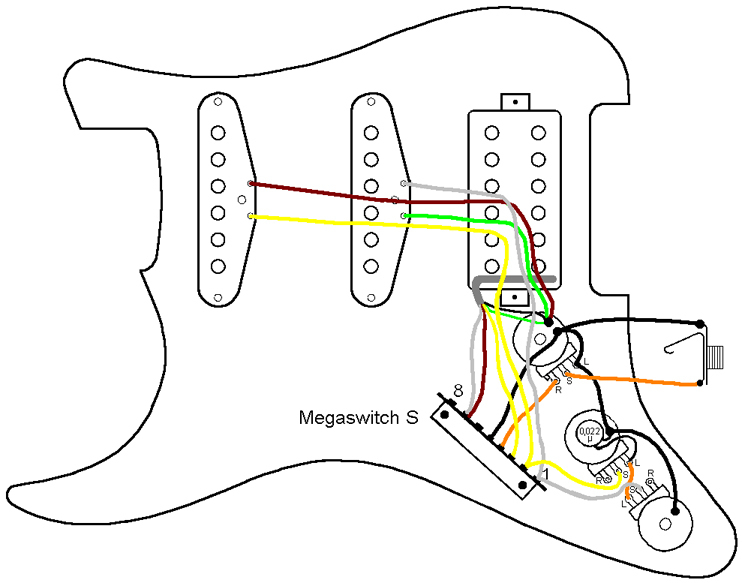 On some Stratocaster versions the bridge single coil is replaced by a Humbucker. In switching position 1 this creates a fuller sound with less brightness in the high end, more warmth in the mids and louder basses. erhält man damit einen volleren Sound mit weniger grellen Höhen und mehr warmen Mitten und lauteren Bässen. A Megaswitch S is used here. If a buzz-free sound is required in position 4, both single coils must have opposing magnetic polarity. 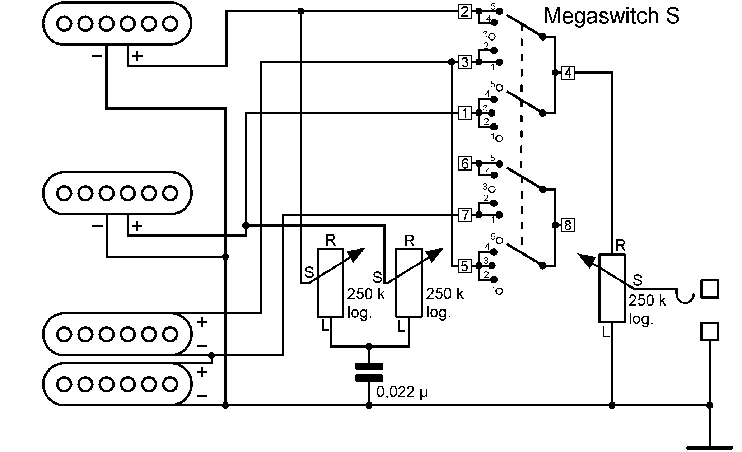 This is a variation on the HSS1 switching system. 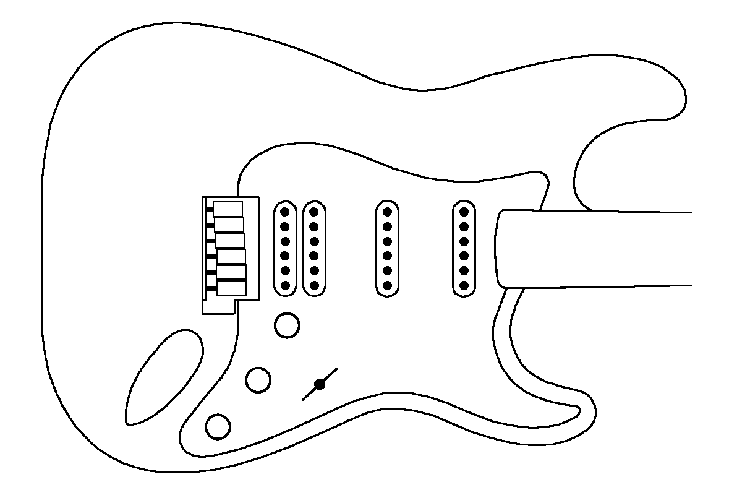 In position 2, the Humbucker is split; the outer coil remains in operating mode and the inner coil is short-circuited. 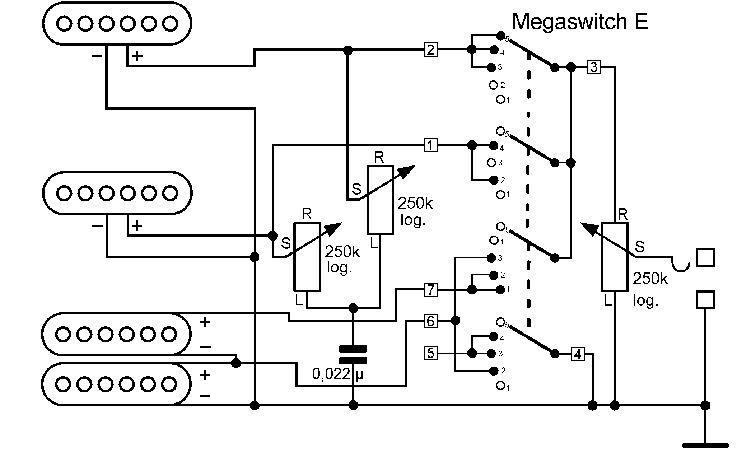 This also works with the Megaswitch S. If a buzz-free sound is required in positions 2 and 4, the following magnetic polarity (from the bridge to the neck) is necessary: NS-S-N or SN-N-S. 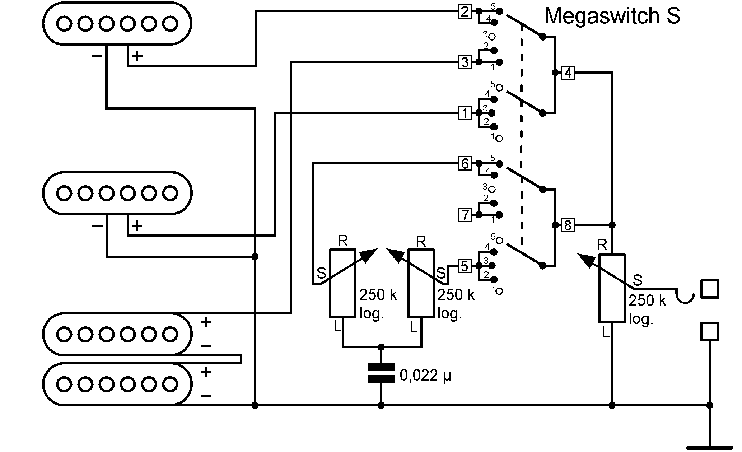 This is a slight variation on the HSS2 switching system. Similar to the HSS2, the Humbucker is split in position 2. Here, the inner coil remains in operating mode. The coil closest to the bridge is short-circuited onto the earth/ground. This also functions with the Megaswitch S. If a buzz-free sound is required in positions 2 and 4, the following magnetic polarity (from the bridge to the neck) is required: NS-N-S or SN-S-N.
With this switching system, the neck and the bridge pickups in position 3 are in operating mode, although the latter (the bridge pickup) is spilt. The inner coil remains in operating mode and the outer coil is open. 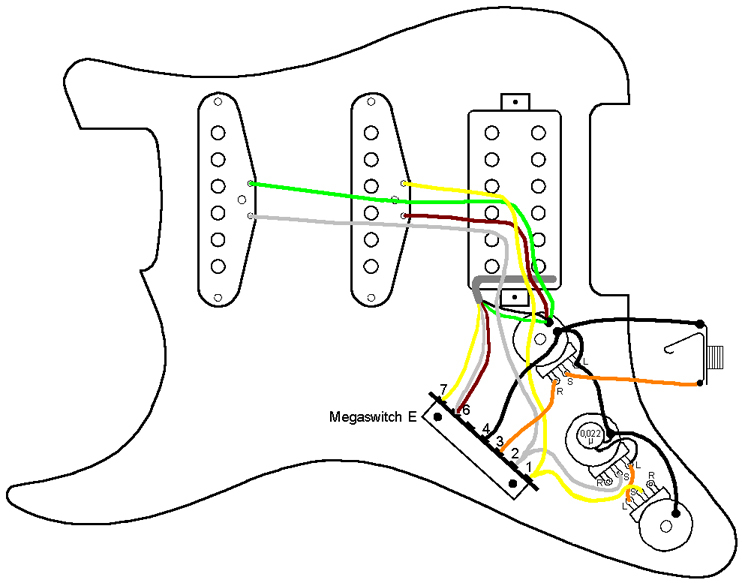 In position 2 the Humbucker is split; the outer coil remains in operating mode and the inner coil is short-circuited. This enables a buzz-free sound in positions 1, 2, 3 and 4. The magnetic orientation of the coils (from the bridge to the neck) is required: NS-S-N or SN-N-S. 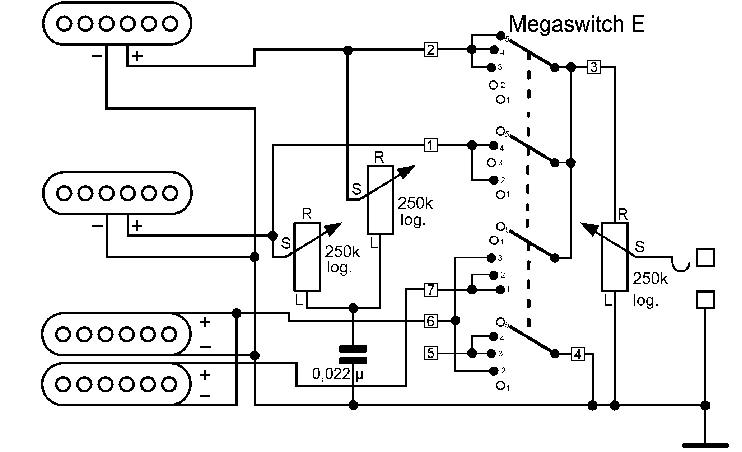 Here, the Megaswitch E is used. This is a slight variation on the HSS4 switching system. In position 3 the neck and the bridge pickups are in operating mode, although the latter is split. The outer coil remains in operating mode and the inner coil is open. 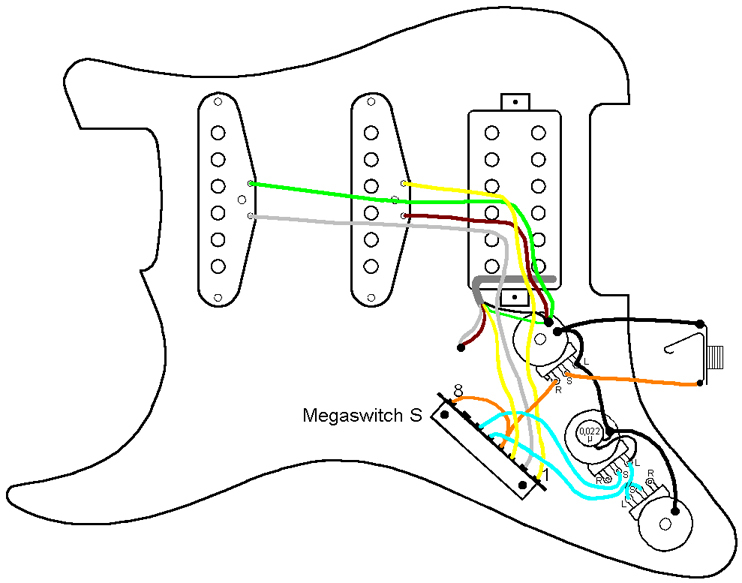 In position 2 the Humbucker is also split, although here, the inner coil remains in operating mode and the outer coil is short-circuited. This enables a buzz-free sound in positions 1, 2, 3 and 4. The magnetic orientation of the coils (from the bridge to the neck) is required: NS-N-S or SN-S-N. Here, the Megaswitch E is used.